After the bombing of Iloilo yesterday we thought it best to evacuate to the farm in Barotac. Most of our furniture was already there. After arriving on the farm for a week, Coné heard the news from the Army headquarters that they expected an invasion within three days. He heard the news in Iloilo and returned to the farm quite excited and said we should move into the mountains. The following morning Coné went to Dueñas, an inland town 53 km from Iloilo and found a bamboo house along the road for us to stay. The next day, with only a few things that we needed, we went on to Dueñas. Our house is quite comfortable, and so much better than where Martha (Rey) and Suzie (Gurrea) are living. Dorothy (Bernas) is with us, but Meñing must stay in Iloilo as some of the town officials must do so. The government of Iloilo is now transferred to Passi, 6 km from Dueñas and located near the railroad – it is very convenient for us as we do not need our car and the fare is only 5 centavos. Gasoline is terribly expensive and hard to secure. Hoskyn’s store is also in Passi and many others have moved to Passi. The Iloilo Mission Hospital has been transferred to Calinog (a town 20 km from us further inland). It is near Tering (Mijare’s) place. The U.S. Army has taken it over. The Army headquarters are way up in the mountains and they are buying up all the surplus rice and storing it so it will not fall into the hands of the enemy. We heard that the S.S. CORREGIDOR was sunk by a time bomb. It was only a few hours out of Manila when the explosion happened. It carried over a thousand passengers, plus arms and equipment for a 200-bed hospital. Many of the passengers were people temporarily living in Manila and were trying to return home to their families. Only 200 passengers were saved. Most of the passengers were students from Negros and Iloilo trying to get away from Manila. We have heard that Dr. Kabayao, his wife and 4 children went down with the boat, but we will never know how many of our friends were drowned until after the war. There are so many false rumors spreading all the time, that one never knows what to believe. Since we have been in Dueñas, we are always going out on hikes to places that we have never seen or heard of before. The Army and the Filipino skippers had long been butting heads. 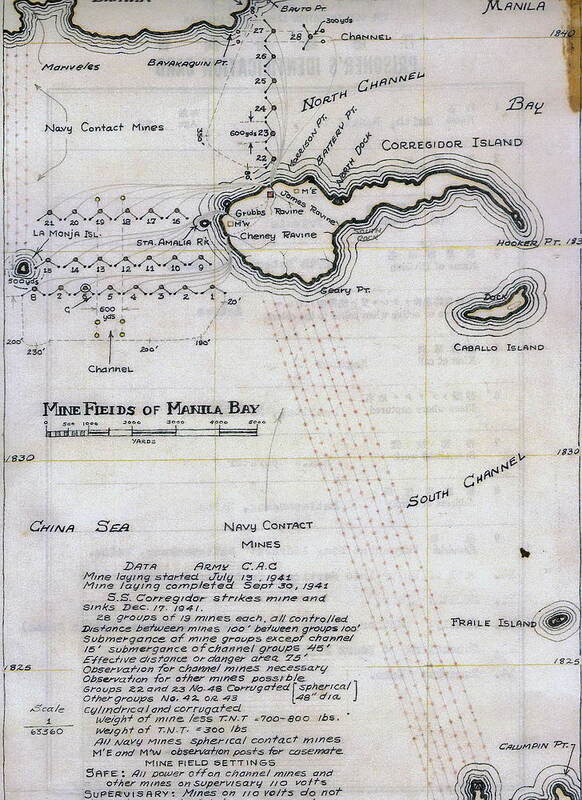 All the channels out of Manila Bay had been mined for many months. At this time, the mining was strictly up to date and operational. At 1 AM on 16 December, the SS Corregidor, carrying 760 refugees, attempted to go thru the mine field without asking clearance. This request would have been granted. The Lieutenant who was on watch in the mine casement, on sighting the SS Corregidor called his superior, who in turn, called the seaward defence commander, Col. Bunker, requesting information as to whether he should de-activate the contact mines in the channel. With a lifetime of experience with the Filipino, going back to the ’98 Insurrection, Col. Bunker said “No!” My first knowledge of this affair came when my duty watch called me at 12:55 AM. The Corregidor had struck one of our mines and in the four or five minutes it took to reach my battery command post, the vessel had sunk. Approximately 500 lives were lost. The 260 or so who survived came on the Rock. Thereafter, we had no trouble with unauthorized Filipino boats attempting to traverse the channel.